My friend, Shannon, shared this simple recipe with me a while ago. Using just a few ingredients, it couldn't be any easier to toss together cinnamon rolls (or monkey bread if you prefer) for the next morning. Put frozen bread rolls in a greased bundt pan. Sprinkle with brown sugar and cinnamon. Pour butter on top. Cover with a damp dish towel and allow to rise overnight. In the morning, bake for 25 minutes at 350*. Allow to cool 5 minutes before inverting on a plate. Try not to burn your mouth by not waiting to eat them! My aunt used to make this. :) Good stuff! I can feel the blisters on the roof of my mouth already. These sound so easy and delicious too! This is one of my girls favorite recipes. They make it on Christmas Eve, almost every year! Very nice,I love a good cinnamon roll. These look wonderful! I would have love to have test tasted these. Looks delicious and easy, Lisa. We have tried the "bought" kind, which is pretty good, but the homemade is probably better for you. That would sure be good on a cold, frosty morning with a cup of coffee. Yum yum yum! This is right up my alley. Those sound yummy. I do that with butter and parmesan for dinner rolls! I make this on Christmas morning, when the house is hectic with present opening and cooking for the dinner ahead.. as you said, it's so easy and delicious. These are always so very good! Look so delicious. Thanks for sharing me your recipe. I pinned that - looks great. Thanks for the recipe. It does look simple. it seems so simple and yummy! We make these, but add a package of cook & serve butterscotch pudding mix. The BEST breakfast! 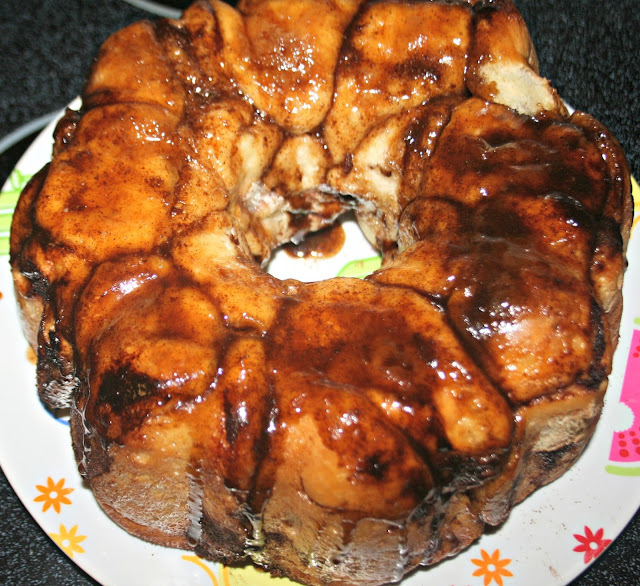 Here's the secret to making "monkey bread" even BETTER: add a package of dry butterscotch pudding mix. Just sprinkle the dry mix over it all. It makes it super gooey and delicious!! YUMMMMMM on the monkey bread ! !